Unit was working when removed for an avionics upgrade. It is being sold.in As Removed condition with a Maxcraft Avionics Removal Tag. This unit is guaranteed functional. 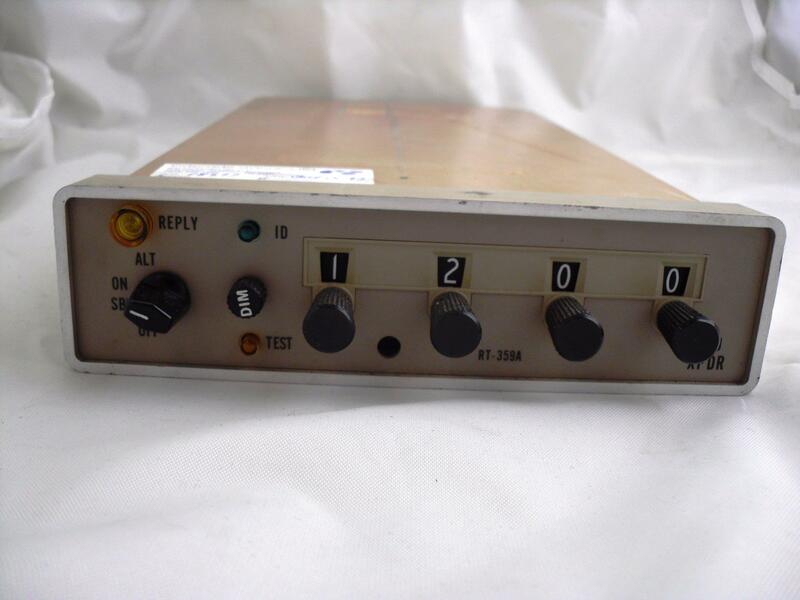 This Aircraft Radio & Control RT-359A Transponder was removed from the aircraft for an upgrade and is being sold in As Removed condition. A Maxcraft Avionics Removal Tag included with the item. This unit is guaranteed functional. We usually ship via Canada Post for domestic and US orders. Quotes for other major couriers are available upon request. If you require international shipping, please contact us for a quote. If desired, you may use your own shipping account. Please provide us with your account number prior to making any payments. Local pickup is available upon request. Item will usually ship within three business days of payment clearance. We will attempt to combine shipping wherever possible. Gyroscopes are extremely fragile, and will be double-boxed with foam for shipping. This will be reflected in the cost of shipping, as well as the size of the package. Payment must be received within three business days. Canadian orders will be charged sales tax at Paypal checkout. All transactions must clear before items are shipped. Any duties, tariffs, or brokerage fees incurred by international shipping are the buyer's responsibility. If payment is not received within seven business days, items may be relisted. If you are the high bidder at auction close, you are legally obligated to purchase the auctioned item. Equipment designated as serviceable, is guaranteed to be in working order and is eligible for return in the event that it is found to be faulty by a qualified avionics technician. Equipment damaged through improper installation by unqualified avionics technicians is not eligible for return. Returns are not accepted on listings designated as 'as-is'. Used equipment sold 'as-is' includes no warranty or guarantee of usefulness. Please contact us prior to leaving any negative or neutral feedback. We aim for 100% satisfaction and endeavour to resolve all disputes. Any Duties or Taxes incurred are the buyer's responsibility. When shipping from Canada to the United States, customs brokerages are generally modest, and rarely more than the cost of shipping. We give no guarantees, however. Please refrain from bidding if export to your country would contravene local or international law. While items designated as serviceable are guaranteed to be in working condition, certification may or may not be included. Please read the item description carefully to determine what level of certification, if any, is provided. Certification provided is guaranteed to be genuine, but it is up to buyers to determine whether or not the certification is accepted by their local aviation authority. The vast majority of the time, we provide a Transport Canada 'Form One', which is fully accepted by the FAA as equivalent to a form 8130-3. At times, we will provide a dual Transport Canada / EASA certificate. This certification is recognized in the European Union. As Removed: Item is in the same condition as when it was removed from service. It has not been formally tested or inspected. See description for details on functionality and return eligibility. Unserviceable: Not guaranteed to be functional and not eligible for return. Serviceable: Item is in working condition and fully functional. Incomplete: Item is missing internal &/or external part(s). New: Item is in new condition and fully functional. Unknown: Item is in unknown condition, and may also have an unknown history. We will describe the situation of the item as best we can. Maxcraft Avionics is a full-service Avionics repair and modification facility located in Pitt Meadows, BC; Canada. Our customer base includes operators and aircraft of all types -- both private and commercial: from business, charter, corporate, and airline operations; to police, military, and air ambulance fleets. Maxcraft Ebay supplements our regular sales and services with clearance of surplus avionics and equipment at often reduced prices.